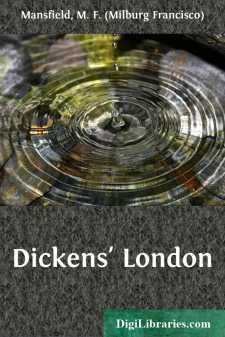 This book is for the lover of Dickens and of London, alike. The former without the memory of the latter would indeed be wanting, and likewise the reverse would be the case. London, its life and its stones, has ever been immortalized by authors and artists, but more than all else, the city has been a part of the very life and inspiration of those who have limned its virtues, its joys, and its sorrows,—from the days of blithe Dan Chaucer to those of the latest west-end society novelist. London, as has been truly said, is a "mighty mingling," and no one has breathed more than Dickens the spirit of its constantly shifting and glimmering world of passion and poverty. The typical Londoner of to-day—as in the early Victorian period of which Dickens mostly wrote—is a species quite apart from the resident of any other urban community throughout the world. Since the spell which is recorded as first having fallen upon the ear of Whittington, the sound of Bow Bells is the only true and harmonious ring which, to the ears of the real cockney, recalls all that is most loved in the gamut of his sentiments. It is perhaps not possible to arrange the contents of a book of the purport of this volume in true chronological, or even topographical, order. The first, because of the necessitous moving about, hither and then thither,—the second, because of the fact that the very aspect of the features of the city are constantly under a more or less rapid process of evolution, which is altering all things but the points of the compass and the relative position of St. Paul's and Westminster Abbey. Between these two guide-posts is a mighty maze of streets, ever changing as to its life and topography. Hungerford Market and Hungerford Stairs have disappeared, beside which was the blacking factory, wherein the novelist's first bitter experiences of London life were felt,—amid a wretchedness only too apparent, when one reads of the miserable days which fell upon the lad at this time,—the market itself being replaced by the huge Charing Cross Railway Station, in itself no architectural improvement, it may be inferred, while the "crazy old houses and wharves" which fronted the river have likewise been dissipated by the march of improvement, which left in its wake the glorious, though little used, Victoria Embankment, one of the few really fine modern thoroughfares of a great city. Eastward again Furnival's Inn, where Pickwick was written, has fallen at the hands of the house-breaker. The office of the old Monthly Magazine is no more, its very doorway and letter-box—"wherein was dropped stealthily one night" the precious manuscript of "Pickwick"—being now in the possession of an ardent Dickens collector, having been removed from its former site in Johnson's Court in Fleet Street at the time the former edifice was pulled down.